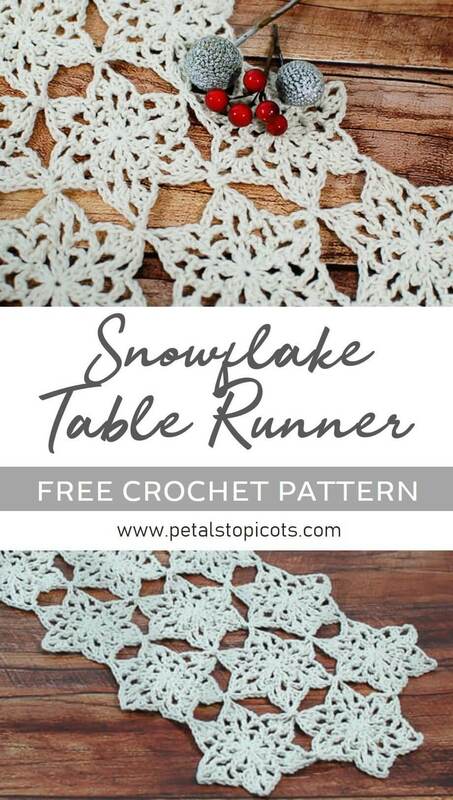 Add some winter whimsy to your table with this pretty Snowflake Table Runner Crochet Pattern … it’s the perfect accent for the holiday season and throughout the winter months! 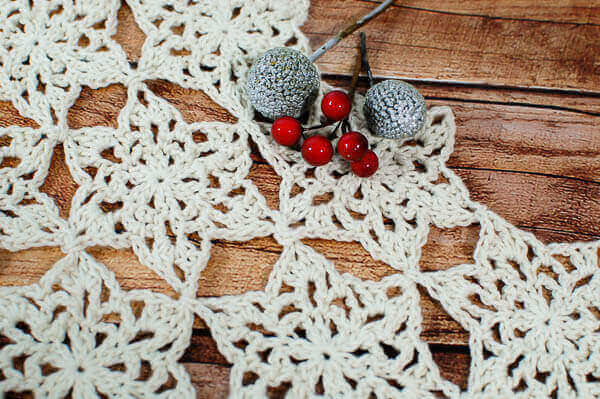 Resources and tutorials you may find helpful in following this pattern: Crochet Abbreviations, U.S. to U.K. Crochet Conversion Chart, How to Make a Magic Ring (see video below), Crochet Stitch Chart Symbols. Finished size measures approximately 28½ in. × 8½ in. If using the join as you go method, work the first snowflake as follows. For subsequent snowflakes, work Rounds 1 and 2 as written and skip down to the next subheading for directions on joining on Round 3. Round 2: Ch 1, 1 sc in first dc, ch 5, 1 sc in next dc, ch 4,*1 sc in next dc, ch 5, 1 sc in next dc, ch 4, repeat for * around, join — 12 sc. Round 3: Sl st in next 2 ch, ch 3 (counts as dc), [1 dc, ch 3, 2 dc ] in ch-sp, ch 2, 1 sc in next ch-sp, ch 2, * [2 dc, ch 3, 2 dc] in next ch-sp, ch 2, 1 sc in next ch-sp, ch 2, repeat for * around, join — 24 dc, 6 sc. To join your next snowflake to the previous, work Rounds 1 and 2 as above. 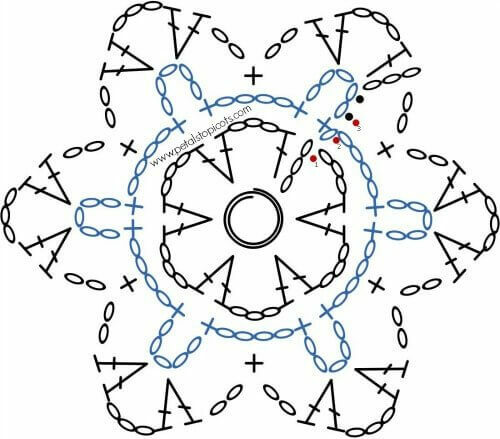 Begin working Round 3 as above but when you reach the first corner of the side that is going to join, connect as follows: [2 dc, ch 2, drop loop from hook and pick it up through adjoining snowflake, ch 2, 2 dc]. See below for placement. 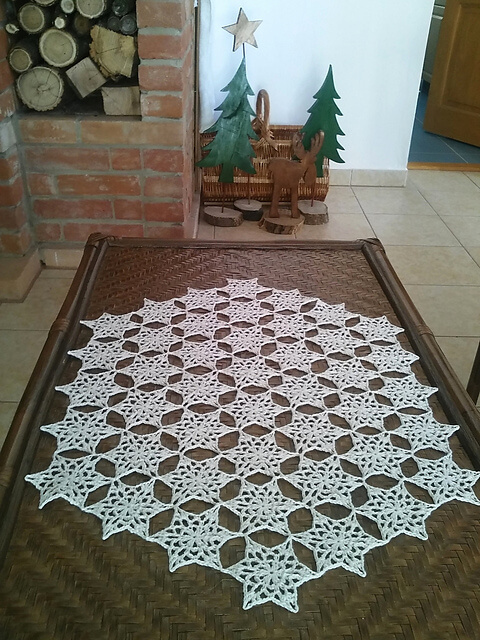 Gorgeous finished runner by esztina on Ravelry. You can see more of her project photos here. Image used with permission. Round 4 written instructions don’t seem to be included in the pattern. 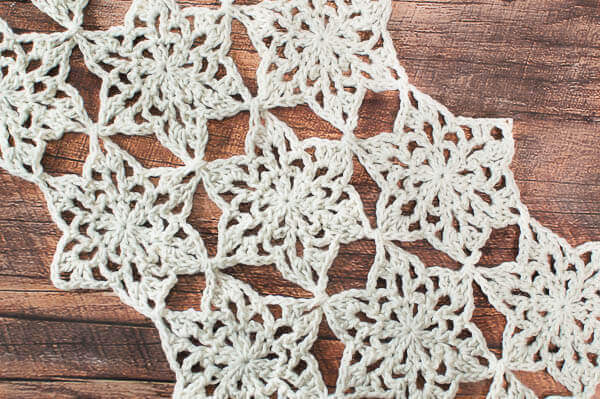 Hi Georgina 🙂 There are only 3 rounds in this pattern. The reference to Round 4 should have been Round 3 and has been corrected. Thanks for the catch! !